Sometimes all I want to do is pick. A little of this, a little of that. I designed my lunch off that principle today. 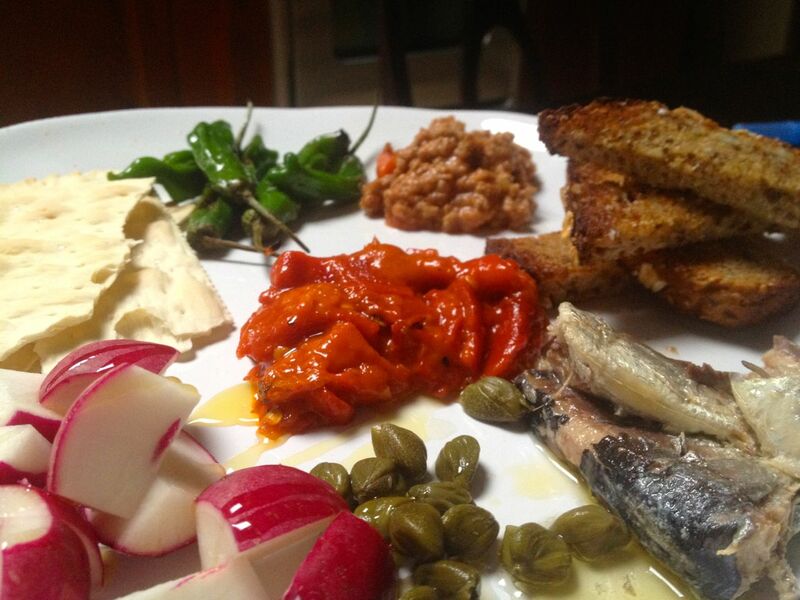 I had some canned sardines, and capers. I had some roasted red pepper sauce tucked way back in a cabinet, sealed and still unopened. It must have been a gift from someone. Then there was a container of bolognese sauce we made at the restaurant. Great multi-grain bread from pain d’avignon. And the last of the shishito peppers. Which I decided I do like, and I think they can be quite versatile. They would be great as a garnish, chopped up and distended in olive oil with some lemon zest, which could be nice on meat or fish. 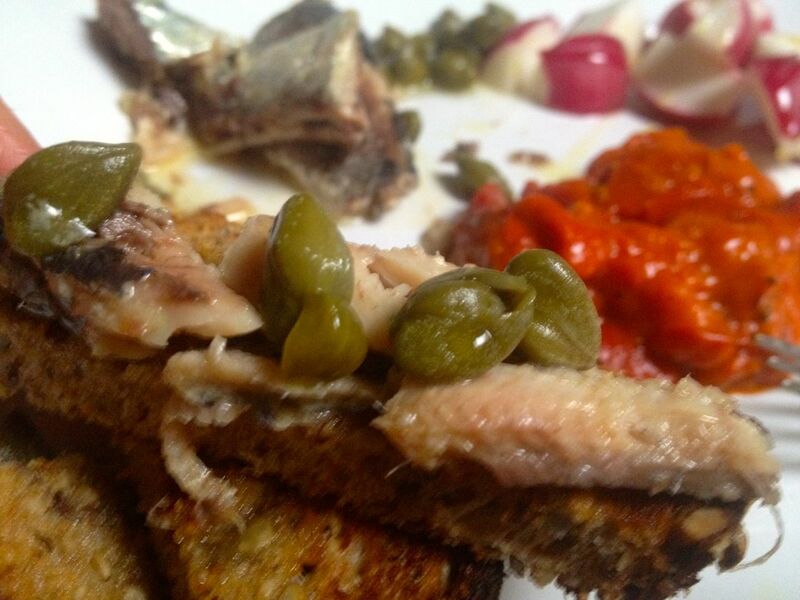 sardines and capers on a “stick” of toasted mutrigrain bread. mmm. I know the fish in these photos may gross some people out. It’s kind of like tunafish, but the saltiness and oil in these canned sardines make them richer and tastier than canned tuna. Sorry if I make anyone squeamish! Learn about the big nutritional benefits of these small fish. This lunch hit the spot, and I was really hungry. I had a smoothie for dessert–berries, banana, coconut water, “The Essential Woman” version of Barlean’s organic oils, and Protein Hydrate powder–something my dad gave me which I still don’t fully understand, but I trust him! I will do a post one of these days on smoothies, and share the powders/ingredients I use and why. I feel like I got sooo many nutrients out of this meal! Dr. Bowden calls them “health food in a can.” They are high in omega-3’s, contain virtually no mercury and are loaded with calcium. They also contain iron, magnesium, phosphorus, potassium, zinc, copper and manganese as well as a full complement of B vitamins. My dad wanted chili for lunch, leftover from the Superbowl. 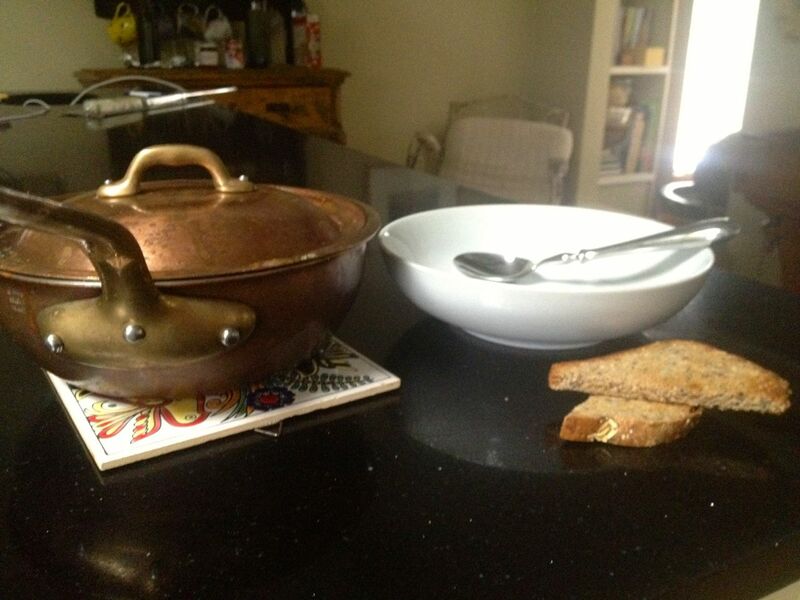 I photographed this because I love the little copper pot that the soup is in. What a great dish it would be for a restaurant to serve a dish in, bringing the pot straight to the table to keep the food nice and hot.